Unencumbered by invasive residential properties or harsh watering restrictions, Talking Stick Golf Club course designers Bill Coore and Ben Crenshaw created a masterpiece out of the canvas of the picturesque Sonoran Desert. From arrival to departure and from every tee to green golfers are treated to first-class service and amenities, and a challenging layout unique to the golf-mad area of Scottsdale. Talking Stick sits on the Salt River Indian reservation land and abuts the Talking Stick Resort and Casino creating a mini Las Vegas feel just minutes from central Scottsdale. Though the course is located just off the 101 freeway, golfers neither hear nor see the busy highway during play. Instead, they are treated to awe-inspiring 360 degree views of the McDowell Mountains, Four Peaks in the distance, and the ample wildlife of the desert. 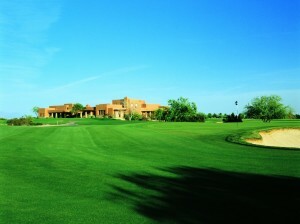 Its defintitely one of the best Arizona Golf Resorts in town. 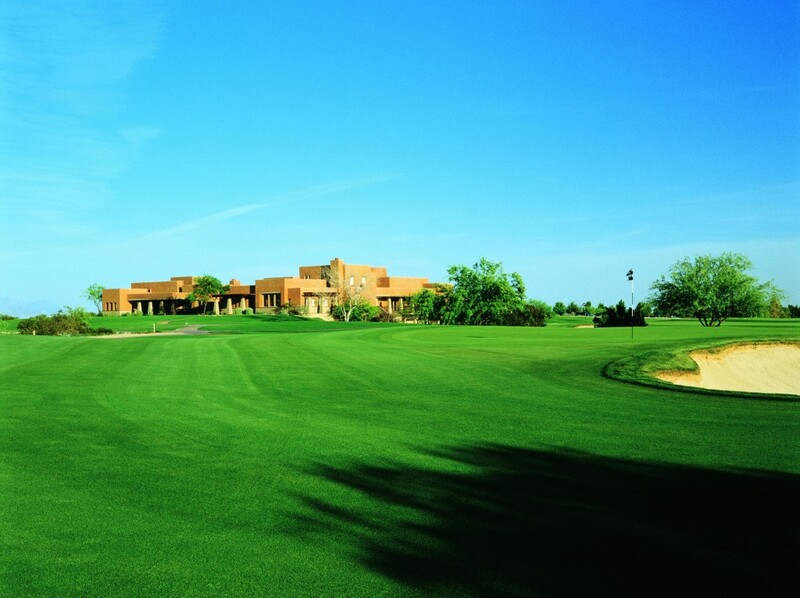 From the beautiful southwest architecture of the clubhouse, golfers are directed by exceptionally friendly staff to one of the largest practice areas in the region. The putting and chipping area allows golfers to see exactly how the course will play and the spacious driving range is larger than the front nine of some courses in central Scottsdale. One of the more refreshing aspects of Talking Stick is how prompt and efficient their starters are with tee times. Too many area courses stack tee times close together which do little more than create traffic jams on the course and 5-plus hour rounds. At Talking Stick, the staff understands and values golfers’ enjoyment of the game and accordingly spaces out tee times and adheres to their schedule. Once on the tee, golfers on the North Course find themselves on an open links course containing none of the station-to-station, forced carry golf so abundant in the desert. Instead, golfers manage the course themselves rather than the course dictating how it is to be played, a welcome surprise for those familiar with Arizona golf. On number two, for example, we found ourselves faced with several options. The fairway is wide open to the right but an out of bounds area runs tightly down the entire left side. Chris, a long hitter, played his drive towards the right center with a bit of a draw while Tim worked the ball left to right to the center of the fairway. Unable to go for the green, Tim laid up to a comfortable yardage but Chris challenged the green but came up short in the hole’s only bunker, designed specifically for that purpose. An ultimate risk-reward hole, we both walked off the green with par. From there, the course presents a plethora of strategies and options for players to attack each hole. We quickly realized, however, that the course was in remarkably good shape for June when most facilities start to resemble the planet Mercury instead of a lush, green golf course. Every hole on the North Course was immaculately maintained with rich green Bermuda from tee to fairway to putting surface. Talking Stick’s location on the reservation makes it immune from strict water regulation which can destroy courses in the arid desert summer. As a result, golfers reap the benefits of a course perfectly maintained year-round with shockingly small peak season rates and laughably cheap summer fees. 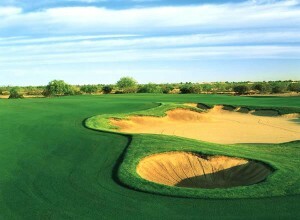 The inward nine holes at the North Course at Talking Stick Golf Club features some of the most challenging and unique layouts in the area. Starting with the lengthy par 3 11th, golfers are greeted by a three hole stretch as visually stunning as it is intimidating. After the sobering “fairway wood from the tee” length of number 11, the course bends towards the east and greets players with the split-fairway par 4 12th hole. Though seemingly reachable, the enticing left side of the fairway proved too far for Chris as he landed in the waste bunker that divides the fairway. Tim, on the other hand, played it safe to the ample right fairway. Though faced with a longer shot into the green, Tim was able to match Chris’s par. After running the gauntlet of the prior holes, the tranquil beauty of the straightaway 13th hole was a welcome surprise, as was the herd of wild horses just beyond the green. After enjoying a round on this gem of a course, a trip to the 26,000 square foot clubhouse is an absolute must. The warm and inviting atmosphere created by the course and staff grows even stronger inside. In addition to the charming bar and grille area, the clubhouse boasts one of the largest and well-stocked pro shops we have ever seen. No wonder it is consistently rated one of GolfWorld’s Top 100 Pro Shops! No Scottsdale golf trip can be complete without a visit to this beautifully diverse course. The added bonus of the newly opened Salt River Fields spring training complex just down the street coupled with the adjacent hotel and casino make it the perfect location for a winter getaway, or a welcome break from burnt-out, station-to-station courses in the summer. We already can’t wait for our next round at Talking Stick! Come play this course on your next Arizona Golf Trip. Click Here for other Arizona Golf Course Reviews!